This video shows the construction of the K-10 Hero Factory hero units featured in the Sho'i mission recently recounted by Zeyek. hey jang when ever I post I will type King and I beg of you ansewme this DO YOU LIKE YU-GI-OH. I just realized!k-10 = k-9(dog). The black K-10 unit looks like a Hero Recon Team Agent! @Anonymous (1st comment)- Card games on motorcycles. I actually used these names for heroes already, however seeing your explanation of how these were directly based off of the Alternate Universe Hordika, I thought these names would work too. I'm a bit bored, what should I do? K-10 could also be a pun on "kitten". I built the white K-10 , the red one (yes, i started spraying parts once I found Tamiya paints at my local hobby shop), and an orange-brown one with Onewa's head. It had a blue core. 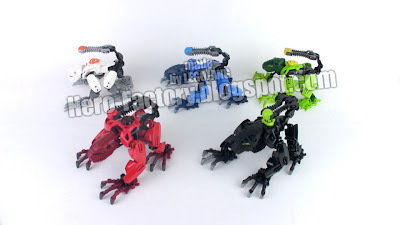 Lego should hire you to continue Bionicle! I mean, you are the MOCer i know! Yeah, why don't you ask lego to hire you? Remember Sidorak from Web of Shadows story arc? Also, XTN, why did you say you spraypainted parts for the white or red K-10 heroes? It seems to me that all the parts are from official sets. The red K-10 has a black hero core Chronos. Wow Chronos you just posted the 10th comment! Like, a couple of minutes ago! What is your lego username? On lego.com? I meant more than two hours ago! I think it is "TheJang". And I forget what time I posted it, it says at the bottom the comment though. hey jang, how do you get the white backgrounds for your videos and pictures? Okay, Joker easily has enough parts. T ake a bunch of JANG's MOCs for example, such as Qiji. She didn't have just red, just yellow, or just orange, right? You could make a hero with multiple colors. I know I will make a purple and black hero using parts from Stringer 3.0. Oh, and Green Lantern definitely has enough bright green pieces to MOC a green 2012-style hero, which I will gladly do! I want a black hero core! @chronos,lordoftime (comment 17) there already is a bright green hero set. it's called breez and it is an official set. MOC bright green heroes exist aswell. I think pretty much everyone on this blog knows who breez is. I am pretty sure the green lantern parts are a different green. So, how many of these did you make? JANG MY MOC IS THE 5TH MOST HIGHEST VOTED CREATION ON THE HERO FACTORY GALLERY!!!!! IT IS MY STORMER XL MOC!!!!!!! I DONT BELIVE IT!!!! What i dont understand is that no one makes furno xl! So i did it myself. No, Breez is lime green. Bright green is Nex's core color. JANG made five K-10 hero MOCs. No need for an Iron Man MOC when the official Iron Man Superheroes Ulteabuild set comes out next year! can i use the pic 4 my ipod screen?